Considering Rovio Entertainment quite literally owes its existence to Apple and the App Store, it may ruffle a few feathers that the company has opted to aim the augmented reality debut of its blockbuster Angry Birds franchise at Magic Leap instead. 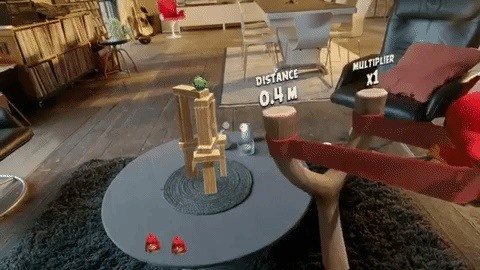 Developed in partnership with AR/VR game studio Resolution Games, Angry Birds FPS: First Person Slingshot will arrive for Magic Leap One Creator Edition this fall. According to a Resolution Games spokesperson, a price has not yet been set for the game. "We're excited to expand the Angry Birds brand and universe to new and emerging platforms like Magic Leap, delivering fans a unique way to engage with their favorite characters. Resolution Games has done an incredible job bringing Angry Birds to life in a new experience that will let players see and feel what it's like to battle the pigs like never before," said Kati Levoranta, CEO at Rovio Entertainment, in a statement. 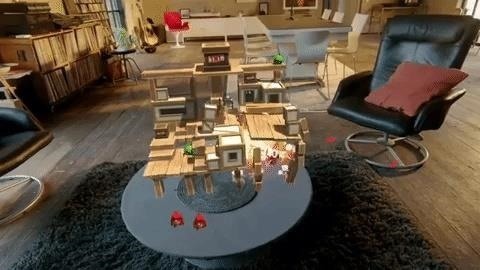 Resolution Games has fully taken advantage of Magic Leap's feature set to reinvent Angry Birds as an immersive experience. True to the "FPS" in its title, the ML1 Controller acts as the slingshot, replacing the touchscreen interface of the mobile version. 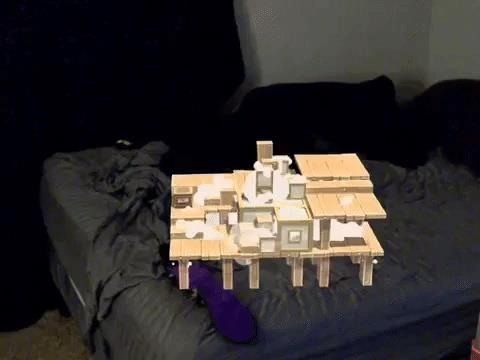 Further, Magic Leap's head-tracking abilities give the game an additional layer of interaction. "The Magic Leap One tracks your head position. This makes it possible to move around and study the level from different directions. You can have a closer look and even interact with the pigs, or you can move further away to get a better score. This kind of intuitive control is only possible with head-tracked VR headsets, and the Magic Leap One takes it one step further and allows you to see the real world without the risk of bumping into furniture or walls," Martin Vilcans, CTO of Resolution Games, told Next Reality. 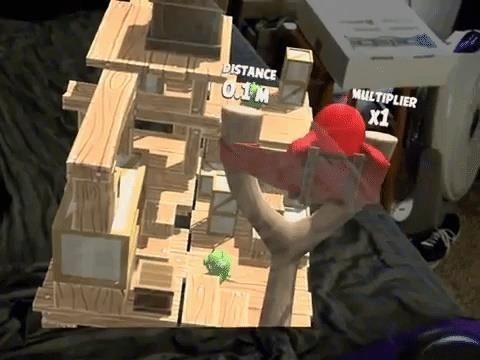 Additionally, Resolution leverages Magic Leap's environmental mapping capabilities to place the creatively-engineered fortresses of those mischievous green pigs on any surface, with content reacting intelligently with the environment. "For example, if there is a wall behind the level, pieces of the level may fly away and hit the wall and in return blow up some of the TNT. Or, pieces may fall to the floor if you play the game on a table. You can also use the environment around as you play, such as bouncing shots off a wall next to you," said Vilcans. I had the opportunity to play around with a preview build of the game. Rovio and Resolution maintain the familiar look of the franchise and the premise remains the same. 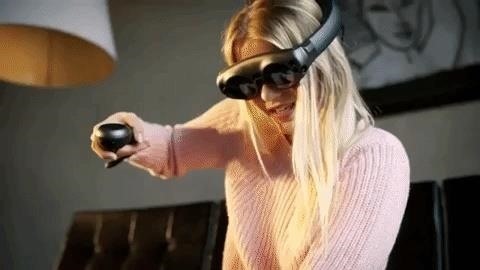 But, on Magic Leap, the gameplay takes on a whole new dimension. Resolution takes full advantage of the mixed reality space. This is evident in the second level, where players will need to view the structure at a lower angle to see that boxes of TNT are hidden below the upper deck. Debris falls off furniture and onto the floor as promised. With the freedom to walk around the space, it is tempting to take aim at point blank range; however, the game awards a score multiplier for shots taken from a meter away (which also serves to keep the content within ML1's field of view). Resolution pulls off a neat trick to literally mask the existence of the Controller as well. The space in the field of view between the game content and the camera is completely occluded, so my left hand disappeared when waived in front of my face. However, when waiving the Controller in my field of view, a virtual slingshot is superimposed over it. In a break in the action, I laid the Controller on a desk away from the game space; when I reached back for it to continue play, I saw a slingshot sitting there instead. My overall impression, just from a preview build, is that this immediately becomes the app to have for ML1. The game could very well be worth every penny, whatever that price may end up being. Rovio's development partner has some experience in adapting games to new forms of interaction. Earlier this year, Resolution Games announced an adaption one of their VR titles for AR; they plan to release Bait! Under the Surface for iOS and Android later this year. "It has been an incredible experience bringing Rovio's massively successful and beloved entertainment franchise to mixed reality. 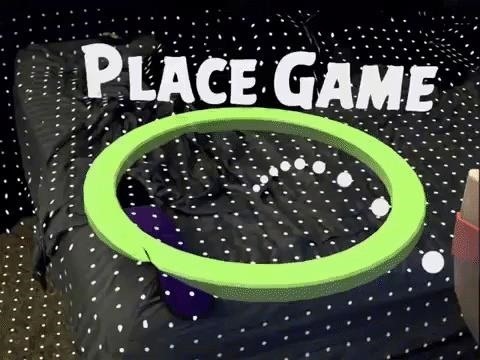 Developing for the Magic Leap platform was a very unique and inspiring process for our team, and we're confident fans will love how the game is brought to life," said Tommy Palm, CEO of Resolution Games. According to Vilcans, the game was built in VR at first, since the development team did not have access to ML1. 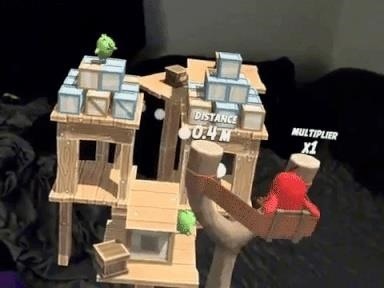 Working with a prototype slingshot game in a VR headset, the team found that Angry Birds not only translated smoothly to 3D but also added another dimension to the gameplay with the first-person perspective, as players can move freely around the game. "Overall, developing for Magic Leap was quite different from hand-held AR and VR. As with every new platform, it takes time to understand the device and its tools. Fortunately, we are very familiar with Unity which supports most mixed reality platforms (including Magic Leap), so we didn't have to learn a completely new engine for developing the game," he said. It's a major coup for Magic Leap to land such a huge title for its debut device, as the game would immediately give the company's fledgling Magic Leap World app marketplace a universally-recognizable title as it continues to build its content lineup. And, on the surface, it's a curious move for Rovio, who could have easily brought Angry Birds into AR via ARKit and ARCore. HalfBrick Studios, makers of another hit mobile franchise in Fruit Ninja, did exactly that in Siege Breakers, its Angry Birds knock-off built on ARKit. "We've always been focused on innovating and driving the adoption of emerging technologies and platforms, and we believe that the future of AR is head-mounted devices, so Magic Leap was a logical platform for us to develop for. It's exciting to see what is opening up for developers and how it can change the way people look at gameplay," said Vilcans. From my brief experience with the game, skipping smartphones for Magic Leap was the right choice. But it is very likely the right business decision as well. Aside from Pokémon GO, neither Apple nor Google have landed a bona fide mobile AR hit, so pessimism for mobile AR is very reasonable. As is the case, mobile AR gaming may be doomed to placeholder status as the tech world awaits the inevitable rise of the smartglasses era.